Reinhard Diennes Studio has created two cardboard storage pieces — a sideboard and a bookcase. Each is available in eight different colors, and can be purchased from Fashion For Home. 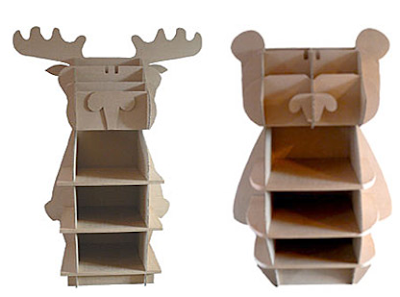 Shelves2go positions its products as "your dorm room shelving unit made of corrugated cardboard." [via Apartment Therapy] Update on July 14, 2014: The Shelves2go website has disappeared. 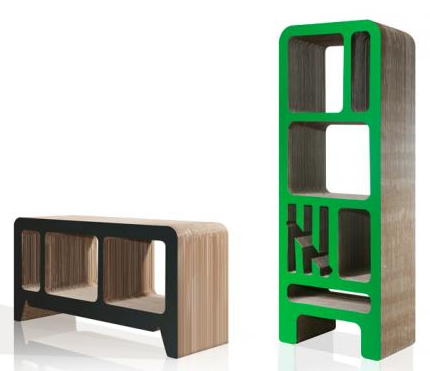 Way Basics makes its furniture, including storage cubes and storage bookcases, from zBoards — which in turn are "made almost entirely (99%) from post-consumer recycled paper." And let's end as we began — with some animals. This moose and bear come from The Green Apple; there's also a monkey. Unfortunately, these cardboard bookcases are only available in the U.K.; the company does not ship overseas. 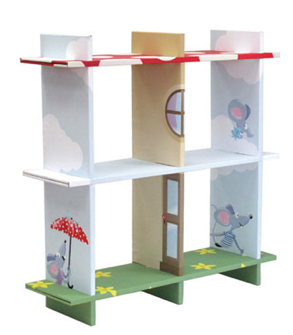 But here's a product that is intended for use in the upper level of a bunkbed: the Tidy Books Bunk Bed Buddy, which holds books and assorted small items. 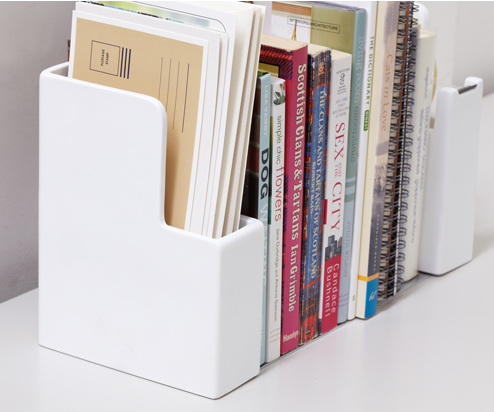 Tidy Books also sells other neat products for organizing children's books, including the Tidy Box. Checklists save lives. 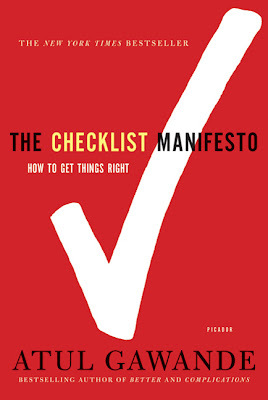 Dr. Atul Gawande makes that very clear in his fascinating book, The Checklist Manifesto: How to Get Things Done Right. Aviation checklists have proven their worth for many years now. Manufacturers like Boeing have become experts in creating effective checklists: precise and practical, and tested in flight simulators. Airlines then make customizations; Gawande tells us that "when airlines merge, among the fiercest battles is the one between the pilots over whose checklists will be used." Such checklists aren't exhaustive, covering every possible issue; they focus on the "the killer items — the steps that are most dangerous to skip and sometimes overlooked nonetheless." When Gawande spoke to Daniel Boorman of Boeing, he learned that "even the look of the checklist matters. Ideally, it should fit on one page. It should be free of clutter and unnecessary colors. 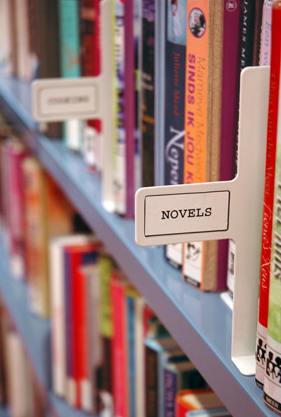 It should use both uppercase and lowercase text for ease of reading." Unfortunately, the surgical checklist developed by the World Health Organization — Gawande was a key player in developing this list — has had much success, but has yet to gain anything close to complete acceptance. I just checked my own area, and many hospitals are actively using the checklist — but many are not. Gawande mentions how he started using the checklist himself, thinking it wouldn't be all the useful in his practice. 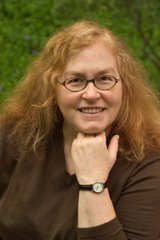 "To my chagrin, however, I have yet to get through a week in surgery without the checklist's leading us to catch something we would have missed." Checklists, Gawande argues, don't turn the users into "mindless automatons." Rather, a well-made checklist "gets the dumb stuff out of the way, the routines your brain shouldn't have to occupy itself with ... and lets it rise above to focus on the hard stuff." Both the aviation and the surgical checklists also help build the sense of teamwork needed to effectively deal with emergencies. While many of us don't work in the complex environments that Gawande describes, checklists can still be useful tools. Reading this book made me appreciate them all the more. Photo by Evan Sharboneau, Photo Extremist; found on Flickr; licensed through Creative Commons. 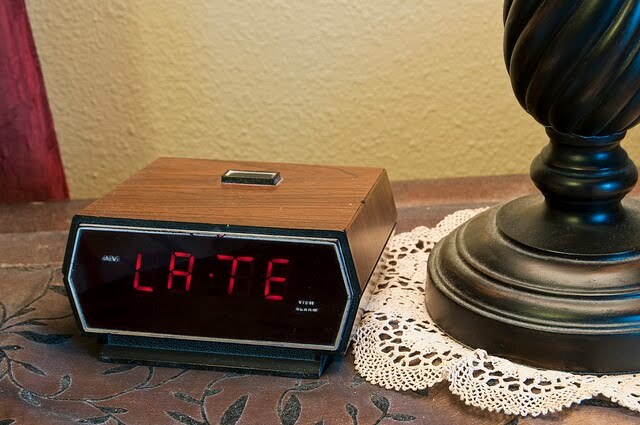 How many of us are in this situation regularly — because we didn't plan our leave-the-house routine well enough, or because we fell prey to what Kathleen Nadeau, also in ADDItude Magazine, called one-more-thing-itis? This is what happened last month when that lady hit my Jeep. After the crash she sat in her car, writing out her phone number for me, saying, "I was late for work." I remember looking at her with absolute disbelief, thinking You almost killed me because you were late for work? That line keeps coming back to me at the oddest times. I'll see someone blow through a red light and hear that lady saying, I was late for work. And then I think, I hope they don't kill someone just because they couldn't bother to leave on time for work today. Tax-related papers. It's easy to be overwhelmed by them, and have them take up an inordinate amount of space. While you should certainly ask your own tax accountant or tax attorney about his or her recommendations on record retention, I personally follow the guidelines I see most often: Keep the returns themselves forever, and keep all supporting documents for seven years. (That's a general rule; there are exceptions.) And since I've seen conflicting advice on whether or not it's OK to rely on scanned copies, I keep paper originals for all those "last seven years" papers. But even with this approach, I had much more paper than I wanted, or needed — and I wasn't storing it well. For the last couple years I've been using my ScanSnap to make scans of all tax-related papers, and then filing them in my file cabinet — and that worked well. But before then I'd been keeping my tax-related papers in fireproof boxes, and the boxes were taking up room I wanted for other purposes. 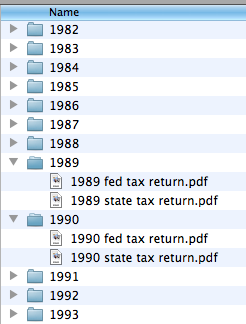 And the old tax returns, dating back to the 1980s, were taking up room in my file cabinet. So this past weekend I finally embarked on my "clean up the tax records" project. Paper reduction: I scanned all the old returns, after blacking out my social security number and my signature. (I don't need either of these floating around in electronic form.) After making sure I had a good backup in place, I then shredded the returns. 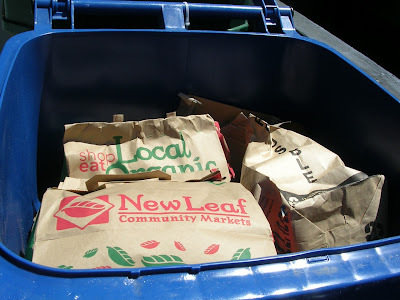 I have a very full recycling bin this week! Improved storage: For returns within the 7-year period, I scanned what had not yet been scanned, and put the papers in my file cabinet — in the space that used to hold all those really old returns. 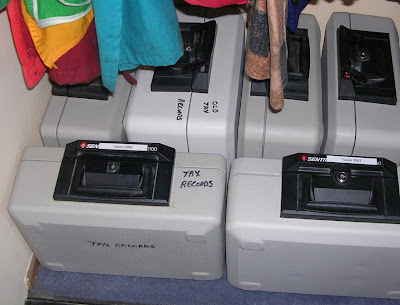 Since I have electronic copies, I'm no longer afraid of losing the originals, and see no need for those fireproof boxes. I'm not quite done with the project, but it's well underway and I'll finish it this week — and then I'll Freecycle all those boxes. While all the scanning was a bit tedious, a good scanner (and a good shredder) made things go pretty quickly. And now I have a lot of reclaimed space — and I have all my tax information at my fingertips, in well-organized computer files. Unique is a word that gets tossed around a lot — but here's a product for storing knives that truly is unique. 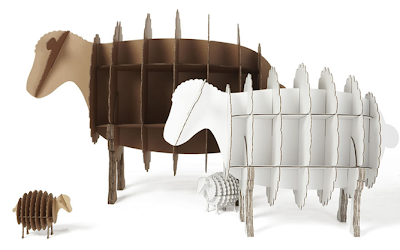 It's the Kitchen Bull from Toro Legno, in Australia — and you can get it through Etsy. As you can see, it's much more than a knife block — it's also a bookshelf, and there's a cheese board tucked away in there, too. 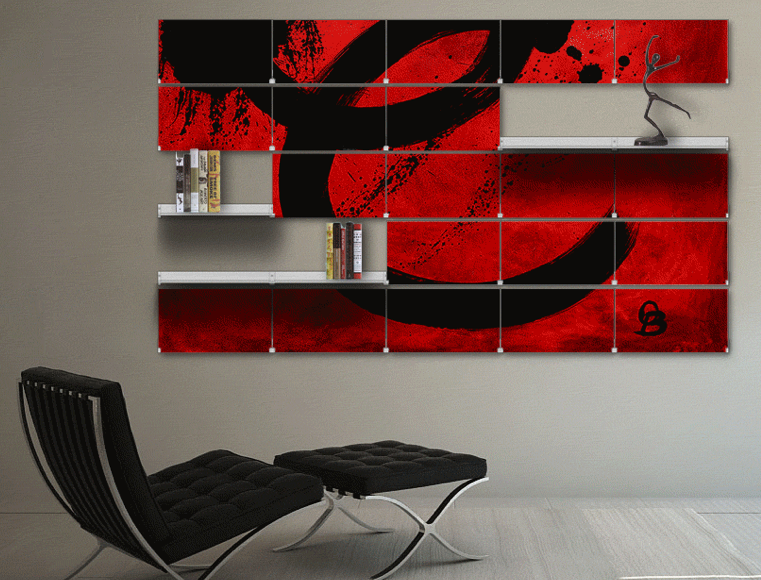 And, of course, it's also a conversation piece, and a work of art. 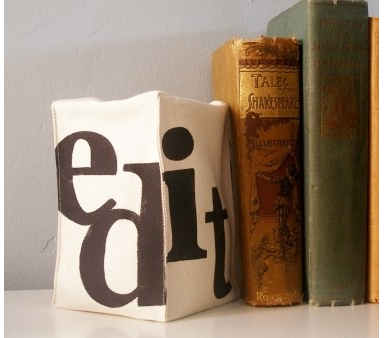 [via Freshome; photo used by permission of Ian Sargeant] Update on August 7, 2013: I'm no longer seeing this product on Etsy. Also from Australia — and also available through Etsy — are the colorful magnetic knife blocks from Feel Felt Found. There are five color choices. And another fun option is the BISTRO knife block from Bodum, which comes in six colors. 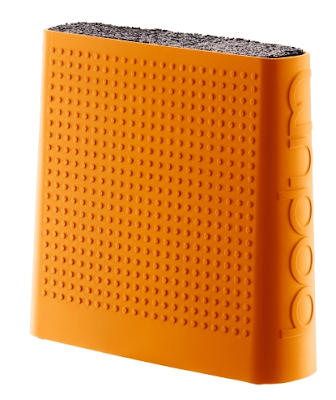 Bodum says, "The inside of the knife bock is made of a myriad of very fine plastic sticks allowing any knife to sit anywhere in the block — tight and secure." 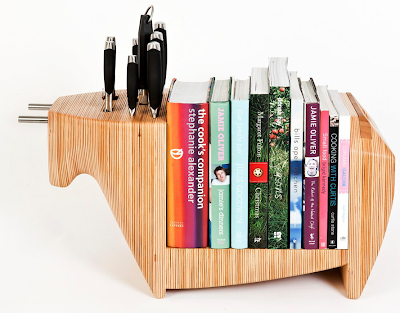 This makes it functionally similar to the Ekobo knife block and the Kapoosh knife block, mentioned in earlier posts. 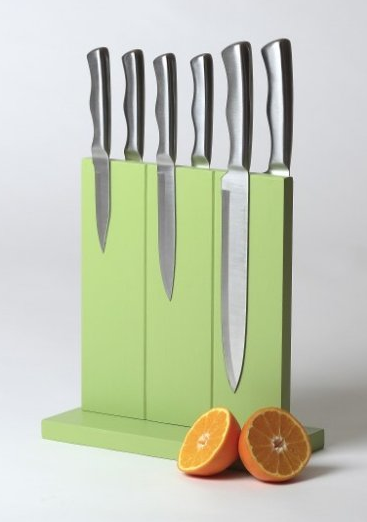 Reader Question: The Best Way to Store the Knives? Photo by Walt Hubis, licensed under Creative Commons. Tornados. Floods. Earthquakes. Fires. Tsunamis. Hurricanes. We read about these things, and often think: I've got extra clothes, or toys, or food, or home furnishings I could donate to help people out. And that's a generous impulse, and sometimes it's useful to act on it. We had a huge explosion and fire in my part of the world last September, and such donations were solicited for a while. But rather soon the requests changed: Please, no more stuff. If you want to help, donate money. Especially in cases of disasters occurring outside of the area you live in, donations of "stuff" are discouraged by aid agencies. The American Red Cross does not accept or solicit small, individual donations of items for emergency relief purposes. Small items such as collections of food, used clothing, and shoes often must be cleaned, sorted, and repackaged which impedes the valuable resources of money, time, and personnel that are needed for other aspects of our relief operation. ... 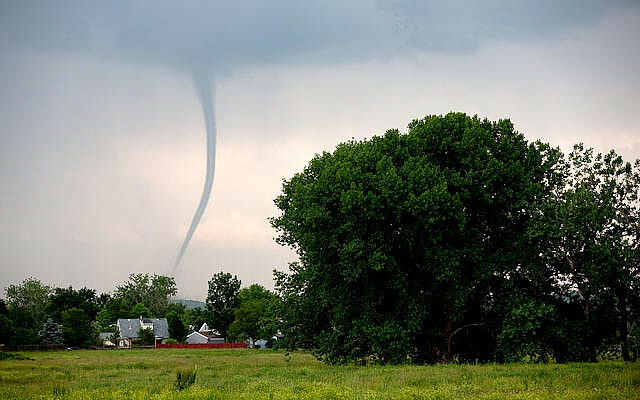 The best way to help a disaster victim is through a financial donation to the American Red Cross. Financial contributions allow the Red Cross to purchase exactly what is needed for the disaster relief operation. Monetary donations also enable the Red Cross to purchase relief supplies close to the disaster site which avoids delays and transportation costs in getting basic necessities to disaster victims. 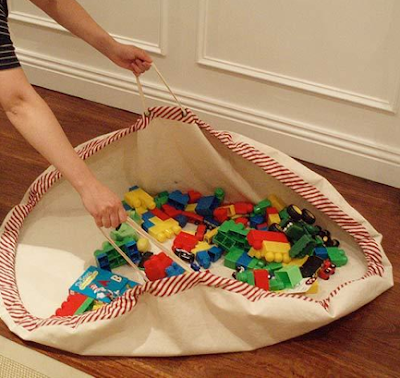 With in-kind goods a lot of infrastructure is required to make those gifts manageable and able to be delivered to those in need. Warehouses must be secured, trucks lined up to transfer the goods, mechanisms in place to get the goods to the disaster survivors … and the list goes on. After the tsunami tons of used clothing were donated, much of it inappropriate to the climate and culture. There were winter hats, coats and gloves donated to southern Thailand and mountains of donated clothing dumped beside the road in India. Donated goods can clog ports and prevent more critical relief items from getting through. Ports can only hold and process so many goods and often the port authorities have difficulty sorting through everything arriving to get it processed and out the doors. But there are plenty of other ways to donate your excess items to good causes. You can give to Goodwill, a local thrift shop whose sales benefit a local charity, a homeless shelter (after checking on its specific needs), a food bank, or Soles 4 Souls — to name just a few worthy organizations. Or you could offer the items to others on Freecycle, or pass child-related items along to a family with children younger than your own; some mothers groups coordinate such passing-along efforts. 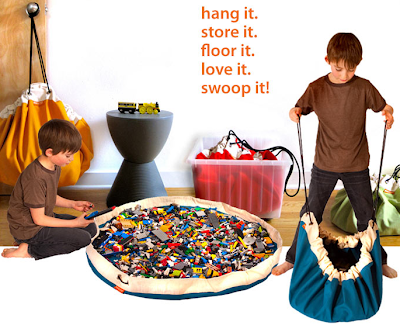 Lego storage is an ongoing challenge for many — but fortunately, clever people keep developing more storage options. 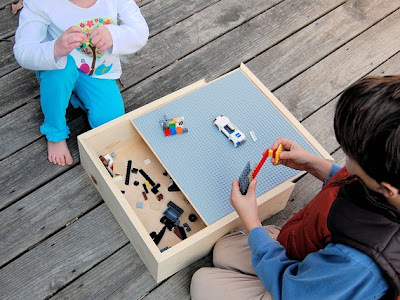 Back in 2007 I wrote about 16 Lego storage options, which I thought was a pretty comprehensive list — and then people added even more ideas in the comments. Last year, I found the BrikCrates. 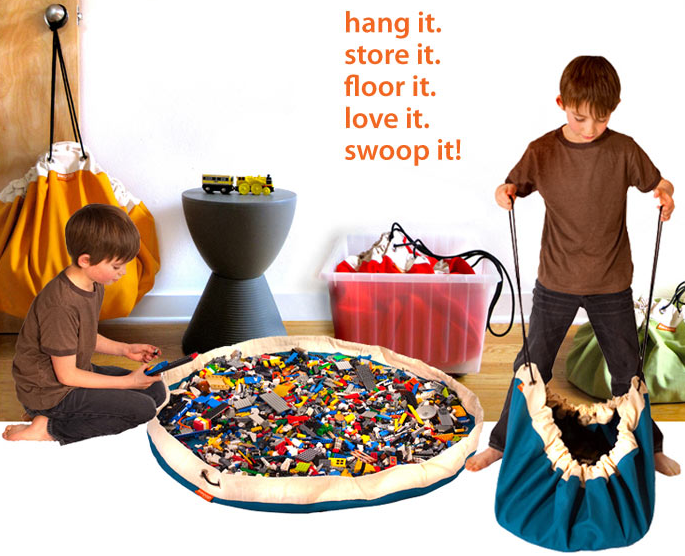 And now I've found two more ways to store the Legos. Both of these are targeted at kids, rather than older collectors. Gogo&co, based in Australia, makes the gogosac. This was mentioned in the comments on my prior post, but I wanted to be sure no one overlooked it. And if you're craftier than I am, you could make your own, as described by Instructables and Bellgirl. Keren Kurti Alexander shows off another handcrafted one on Flickr. If you've been in a legal office lately, you may well have seen these files around — even if Elfman writes about them as a thing of the past. And plenty of other people use them, too. As John's Legal Lexicon explains: "When your lawyer says 'Put it in the Redweld,' he is referring to one of those large, usually red, file folder holders with a red ribbon for tying it shut. The name comes from the colour and the fact that the manufacturer wanted to emphasise the weld-like strength of the glue holding it together." Notice that Redweld is always capitalized? That's because it's a registered trademark. Technically, the products are Redweld expanding pockets and envelopes. Companies other than Redweld, such as Smead, make similar expanding pockets, but they aren't called Redwelds. And anyone using the term "redwells" is probably just confused about the term. Want to know why lawyers like Redwelds? Blond Justice explains why she prefers them over binders, and how she uses them when preparing for a trial. The comments are interesting, too, as other lawyers weigh in. And finally, LacquerWear informs us that there's a nail polish which matches the color of a Redweld. You've sorted through the books, moving along those that no longer fit your life. 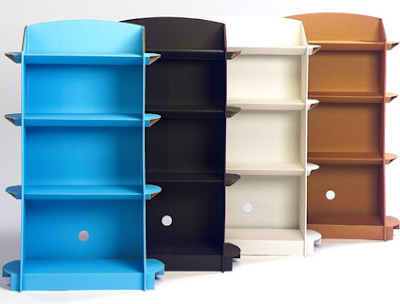 Now it's time to organize the remaining books on the bookshelves — which means you just might need some bookends. 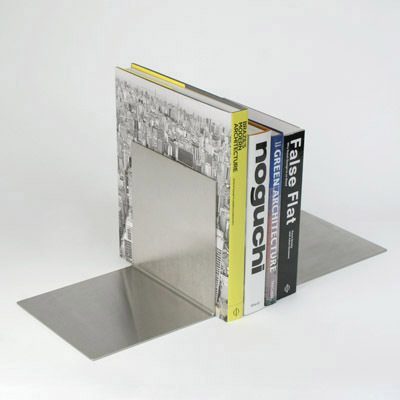 The editor in me was pulled to the bookends shown above — one of eight designs available from Boxed. If you're a fan of the Keep Calm products, look for the ones with that theme. "U.S. customers will receive this product filled with beans, while for the other countries the bookend will be mailed empty. Fill it with 3 cups of dry beans, rice or even sand." Robots S.P.A. provides us with these Giulietta e Roméo bookends, available from Made in Design and Panik. The Puhlmann Filemaker bookend allows you to easily label sections of books. 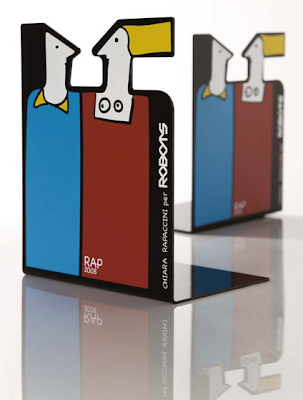 The same company makes the Zoo brand bunny bookends. These are easy to find in The Netherlands — and harder to find elsewhere. 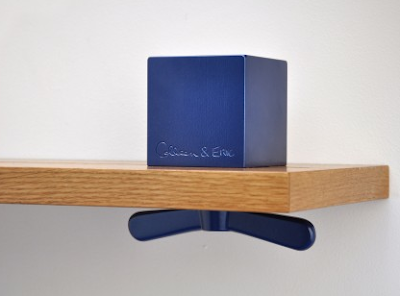 Update on April 20, 2014: I'm no longer finding any place that sells the Filemaker bookends. Every hear of Custom Week? I hadn't either, until a few hours ago. But June 6-13 is the first annual Custom Week, where a number of companies that provide customizable products are offering discounts. And some of those companies make organizing-related products. I've already mentioned CustomMade a number of times, and shown you some of the furniture I found through that site. So let's look at two other companies this time. Ghost Nest lets you create customized knobs, using one of three standard styles and your own text and/or artwork — or you can choose some artwork provided by various artists. 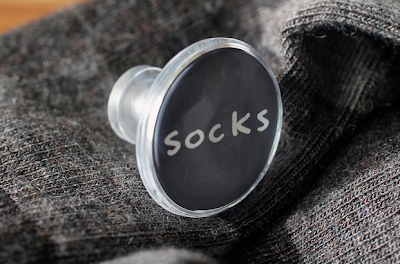 The SOCKS knob above is the design of graphic artist Matthew Langille; the photo comes from the Ghost Nest Flickr site (and is used with permission from Ghost Nest). Custom knobs would be an interesting way to label dresser drawers — or any other drawers! 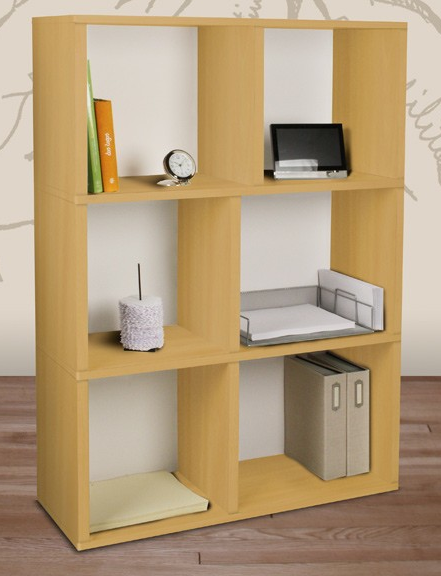 At what I imagine is the other end of the price spectrum, there are the amazing Riveli shelving systems. I have discovered the benefits of metal wreath holders. I have three on my bedroom door and they hold my small collection of scarves as well as my winter jacket during the winter. I have one on the bathroom door and it holds my nightgown. I suddenly realized after reading your post that if I had a winter coat or two, I could hang a couple inside out on my front door and use that as a coat rack. They work fine, the price is reasonable, and installation is very simple. In a pinch I can "borrow" one and use it to hang a wreath on the front door. 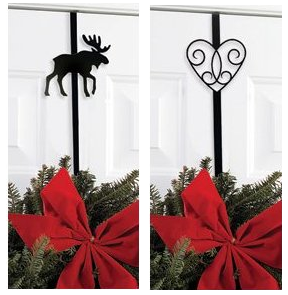 Rachel got me curious about wreath hangers, so I looked to see what's available beyond the basic ones. If you like Rachel's idea and want to add a bit of pizazz, there are some nice wrought iron wreath hangers made by Village Wrought Iron and sold many places online. 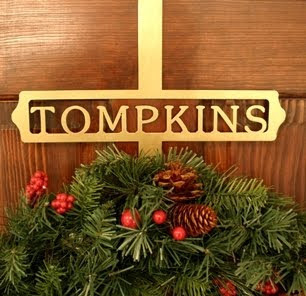 And if you are willing to spend even more, you can get a personalized wreath hanger. The examples on the web site all show family names, but there's no reason you couldn't order one that says ROBE or whatever, to remind everyone about what goes where. 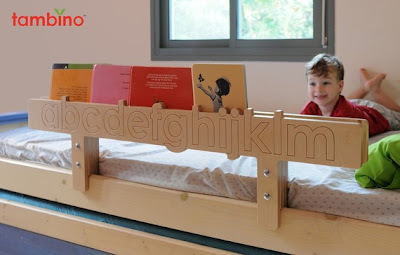 Or say you wanted a place for each of two children to hang something; each wreath holder could have the child's name. Built-in labels! 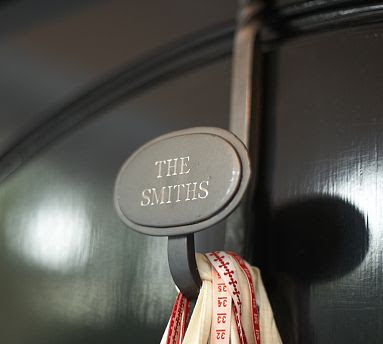 Pottery Barn also has personalized wreath hangers, in a different style. 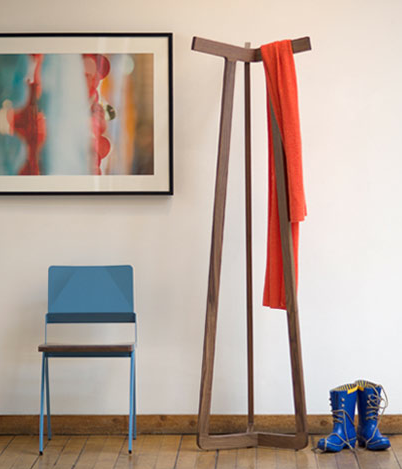 Don't have enough closet space in the entryway? 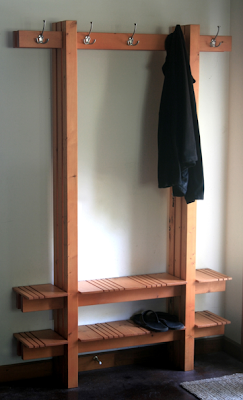 Looking for an easy way to get coats (or other clothes) hung up, rather than tossed on the floor or across a piece of furniture? 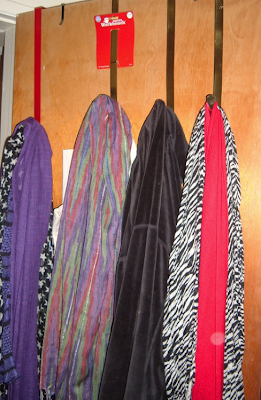 Then you may want to consider either hooks or a product like the ones shown here. 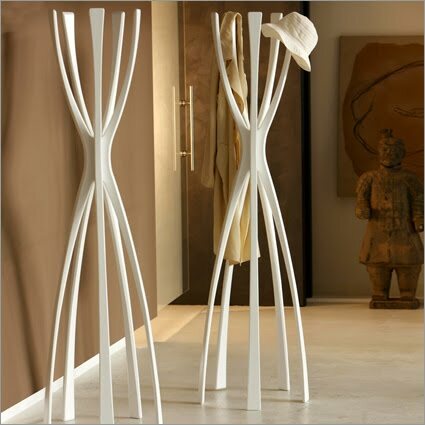 Porada, an Italian company, makes the Flamingo coat stand, available in white, black, walnut and other finishes. One place to buy it is Mac & Mac Interiors in the U.K. This coat stand is called Tree. It is one of the many coat stands — others include Twist, Pole and Coat Lamp — designed by Robert Bronwasser of Smool for Cascando, "a Dutch brand of innovative office and home accessories" where Bronwasser is now the art director. Of course, you don't have to go for modern styling to get a nice coat stand. 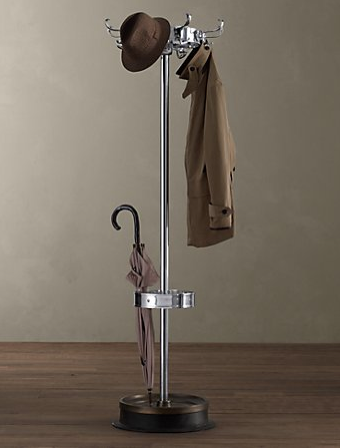 Here's Restoration Hardware's English Mac and Brolly Stand - a nice-looking adaptation of an old favorite. And here's a combination coat, hat and shoe rack from Mark Love Furniture, found on CustomMade. 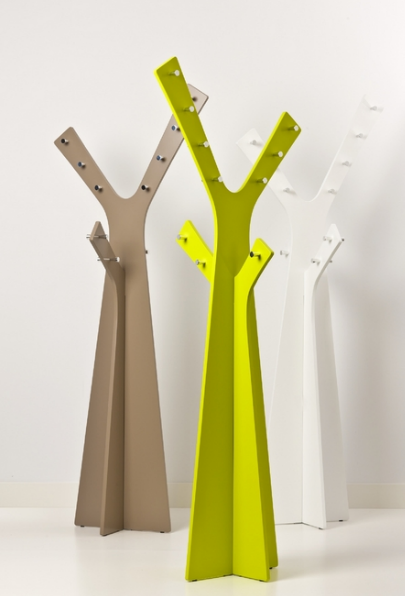 Finally, for a very different approach, take a look at the Martha coat rack from E15, sold by Nest. 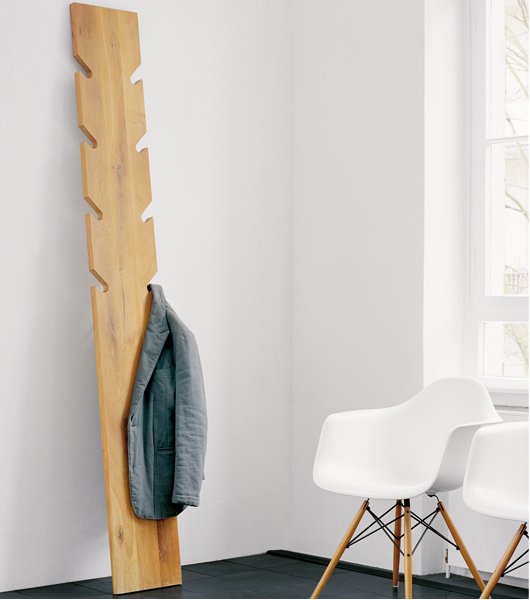 Yes, that's solid wood.